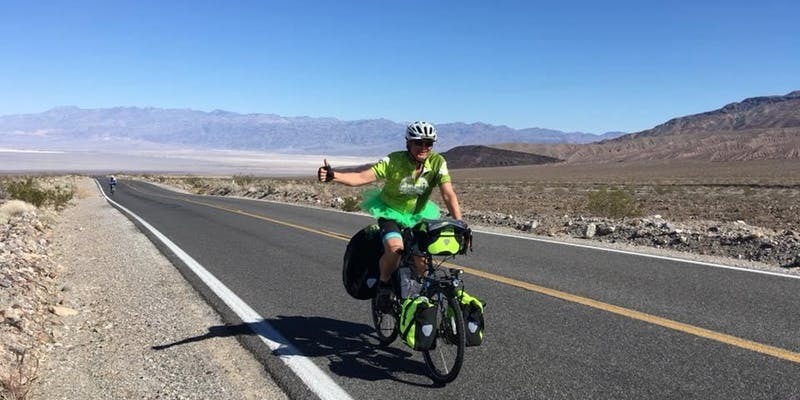 One of our members/bike leaders is doing a trans-continental bicycle ride to raise awareness about environmental issues! Tim Oey (College, '84) will start his bike ride from San Francisco's Ocean Beach (Great Hwy & John F Kennedy Dr) on Saturday February 23, and will go all the way to Boston to attend his 35th Harvard College Reunion. It is a bit of a ride to Boston, so Tim could use some extra encouragement as he sets out on his journey. Please join us in a send-off for Tim at Ocean Beach, 9am on Saturday February 23rd. We'll begin with a wheel dipping ceremony in the waters of the Pacific Ocean, here a bit about his ride, and then ride along with Tim for the first few miles of his journey. You can choose to do the entire first day's ride, or only part of it. 1) No Ride: people are welcome to just come to the wheel dipping ceremony, hear a bit about Tim's upcoming trip, and wish him luck, without joining us on the bike ride. 2) Short Ride: If there is enough interest, we will also arrange for someone to lead a group from Ocean Beach to Lake Merced (the first 5 miles of Tim's ride) and back again (flat 10 miles). 3) Long Ride: Ride along with Tim for his full day of riding from Ocean Beach to the Mountain View Caltrain Station (https://ridewithgps.com/routes/29276774?privacy_code=AZdHWQ9xnEG7goRw - 44 miles, 2600 feet of climbing -- bring snacks and a lunch). IMPORTANT: Each participant must own/rent/obtain a bicycle and helmet prior to the event. Please note this event is rain or shine and will involve bicycling on roads alongside car traffic. MEETING & ENDING POINT FOR NO RIDE and SHORT RIDE OPTION: Beach (west) side parking lot at Great Hwy & John F Kennedy Dr.